It’s the Fall so what does that mean? We’re in for another iteration in the Skylanders franchise. Vicarious Visions is working on this year’s console version of the series and they’ve offered up some really great new features. Kaos is once again the antagonist and he’s captured Master Eon. He’s planning to use a machine with a name that Cobra Commander would be proud of called the Doomstation of of Ultimate Doomstruction. 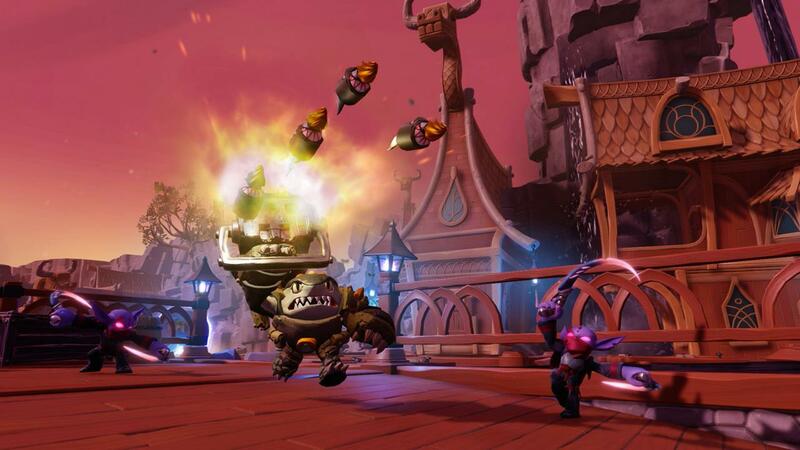 With the help of some new Skylanders and their vehicles, you’ll try and stop Kaos from seeing his plan come to fruition. The campaign isn’t too long and as with the previous games, you can keep on playing once you finish it. It took my son and I about 7 hours or so to get through the entire campaign at a moderate pace. The animation is just top notch in both the cutscenes and during gameplay. 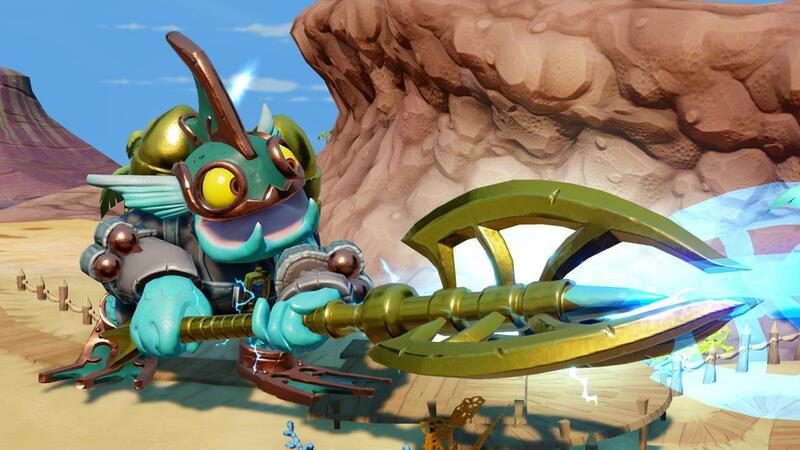 You really have to commend the artists and animators as I think this is the best looking Skylanders game I’ve seen. All the character models exhibit a lot of life when talking with the way they move and their facial animations. From the various characters to the vehicles, the game’s visuals are very solid and well done. Gameplay will be familiar to those that played the previous games. You’ll place a character and a vehicle on the USB connected portal to put them into the game. 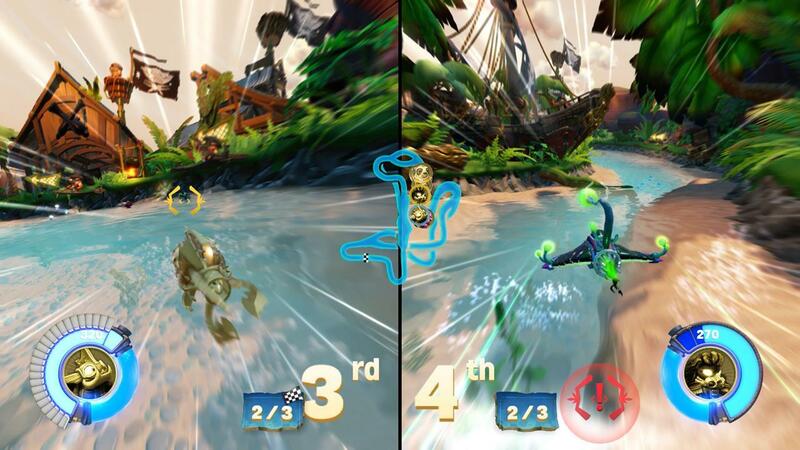 You’ll be able to switch them out at anytime and use characters from previous Skylanders games. Unfortunately, you can’t use villains in traps if you have Trap Team, but you can still use the traps to offer up some small boost to your vehicles and those with villains trapped will unlock a Skystone for that villain. The portal allows for a single trap to be inserted in and in a small disappointment, there’s no lighting effects this time around. The big addition this year is the use of vehicles. The vehicles encompass land ,sea, and air so you’ll be able to navigate through the game in three different types of environments. Each vehicle has different abilities and handles slightly different. You’ll be able to upgrade vehicles with new parts that will adjust its stats and looks. 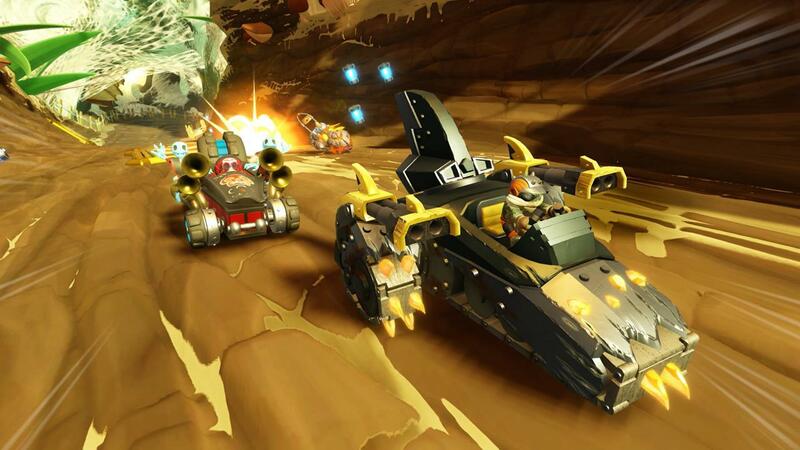 Each vehicle also has a specific Skylander that pairs up with it. 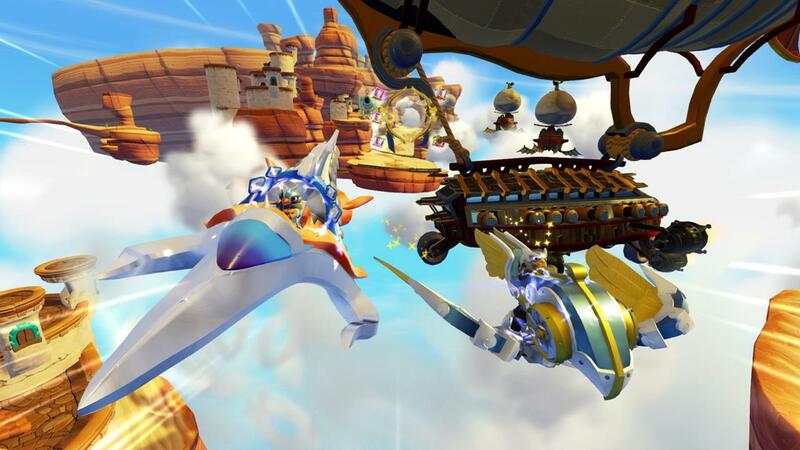 Any Skylander can pilot any vehicle, but pick one that’s its “partner” and you’ll upgrade or “supercharge” it with new abilities. You can’t use an older series figure though to supercharge the vehicle. 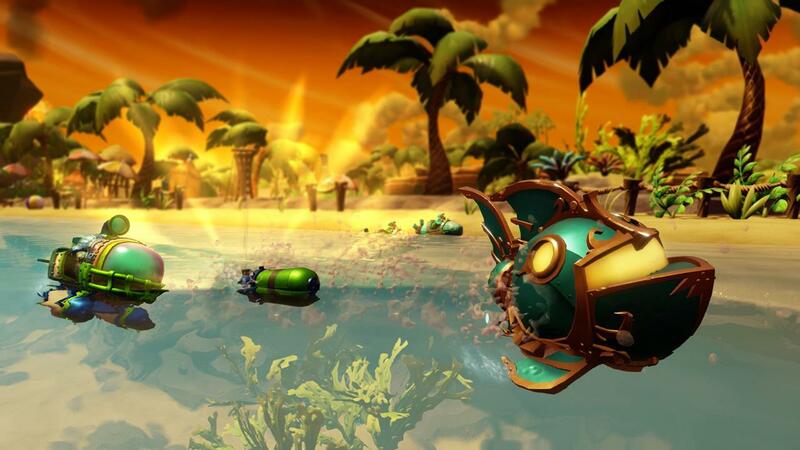 For example, the Reef Ripper vehicle’s driver is a version of Gill Grunt. The SuperCharger version will give the Reef Ripper extra abilities, but a previous game’s version of Gill Grunt won’t have any effect on the vehicle. As for the toys themselves, this is the first time a Skylander toy will have articulation, but only in the vehicles and only when it makes sense. Wheels spin on the cars, helicopter blades rotate, the fin on the sea vehicle goes back and forth. The articulation makes the toys a little more fun to play with when not used in the game. You can’t fit any Skylanders in the cockpits of the vehicles, of course, but they are all crafted well with some nice detail. If you’re wondering if you’ll need to buy more vehicles to finish the campaign, you’ll just need the land vehicle in the starter pack to experience the end of the story. Yes, the other vehicles will unlock other areas to explore, but right off the bat you can go from start to finish without having to purchase an additional vehicle type, which is a good thing as you won’t be hindered from going through the campaign if you don’t spend another cent in Skylanders toys. The vehicles add a lot more gameplay to the game and Vicarious Visions didn’t just throw them in there to compliment the action that’s already present in the series. Let’s start with the campaign itself. Certain vehicles will have access to certain areas. Logically, sea vehicles will be needed to water levels and air vehicles for flying missions. 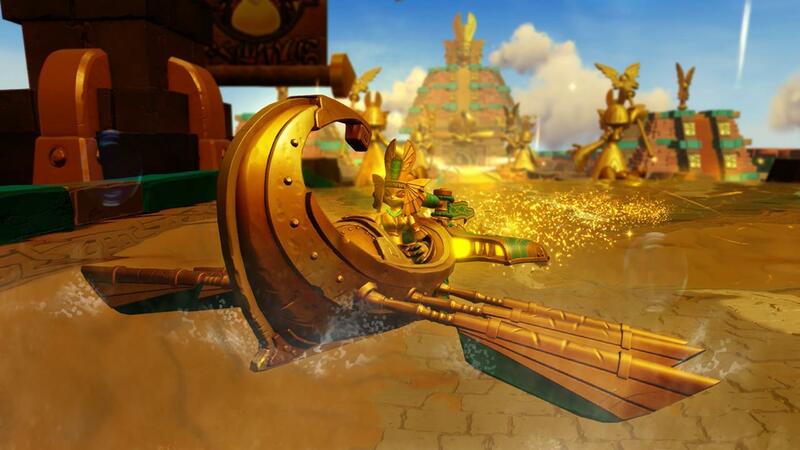 And certain elemental vehicles will be slightly stronger in certain sections, just like Skylanders. Driving and piloting the vehicles were simple and pretty much frustration free. That’s key with young ones playing the game. You don’t want to make it too hard, but offer up some challenges when driving around. Controls won’t be something that will hold anyone back as it’s simple and the levels aren’t frustrating to drive or fly around. Vicarious Visions did a good job in making the vehicle sections varied with different viewpoints at certain times. Most of the time you’ll view behind the vehicle, but some missions will be a side view while others can sometimes be a more far away view of the map with a free flowing vehicle control scheme. It’s better than being stuck behind one view all the time so I’m happy that Vicarious Visions went and thought up different ways to use them. You won’t just be racing to the next level though. It would have been easy for Vicarious Visions to just stick transportation levels in and have you drive and fight from one area to another. There are other activities such as gathering boulders with a land vehicle or shooting targets scattered throughout the level. So like how there’s variety on how the vehicles are controlled from a certain viewpoint, there are different activities as well when using the vehicles in the game. If you play with a friend cooperatively, one will be driving while the other can control the weapons. A cursor on the screen shows where the second play will be shooting the vehicle’s weapons. Besides serving as a gunner, the second player can hold down the circle button to gather gear parts that help with upgrading vehicles. And if you want to switch up the driving duties during the game, you can easily just hold down the L1 button and the controls will switch between the two players. How easy is that? Besides using the vehicles in the campaign, Vicious Visions added racing to the list of things you can do. 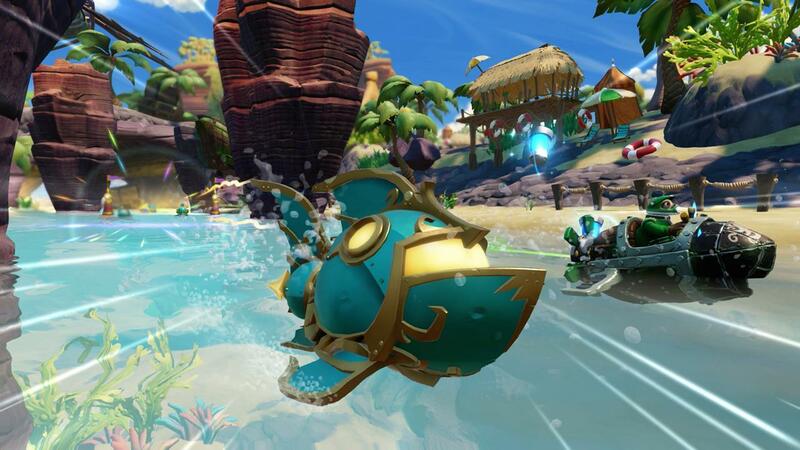 It’s Mario Kart in the Skylanders style. The tracks all have some nice design and a lot of animated backgrounds to them making them look very alive. Just like Mario Kart, there are random boxes that will give you a certain power ups. Thankfully, Vicarious Visions didn’t go through the Mario Kart route of letting the last person in the race always catch up. Yes, they’ll get slightly faster power ups and there’s a possibility to win even if you are behind, but don’t expect the game to always keep you close. If you mess up a lot, you will stay last, which is how I think it should be. 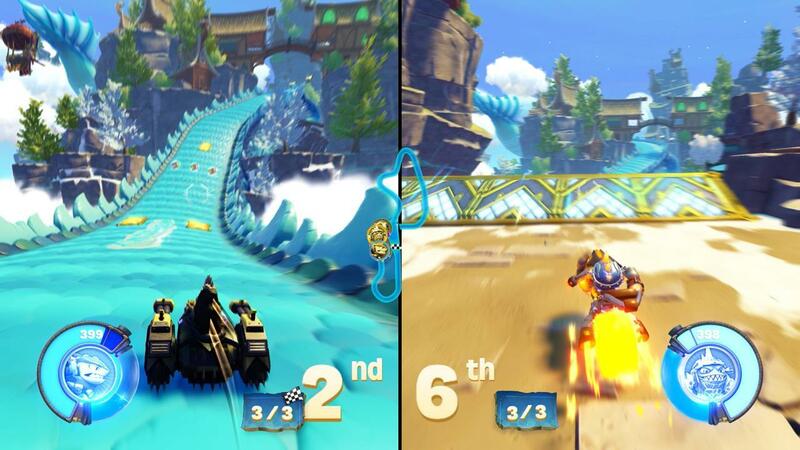 With the base game, you’ll have two courses for each type of vehicle to race on. There will be new racing sets that add two more tracks for a total of four in each type along with a villain cup race. No word if there will be additional tracks, but there will be a total of six courses without buying anything additional to race on. 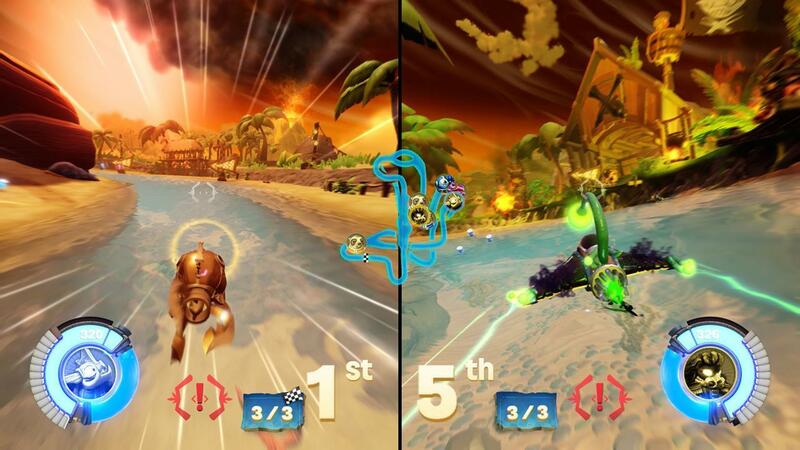 All vehicles have weapons so you can attack the other racers during the race. Knocking the opponent’s health to 0 will slow him down to a crawl as they quickly regenerate their hit points. To counteract someone constantly shooting, you have an ammo bar that depletes and slowly regenerates. You can pick up powerups or blue potions to refill it quicker, but it’s good there’s some limits on the usage of your weapons. 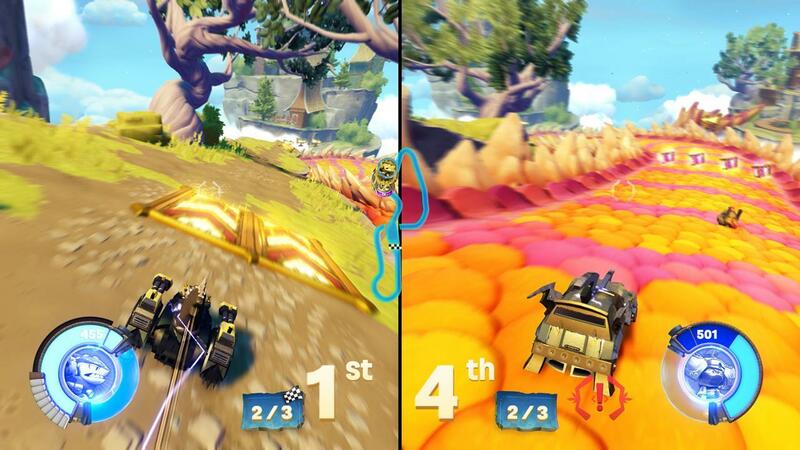 The ammo bar is also tied to your boost so there’s a nice balancing act you’ll have to perform between attacking another racer or boosting your speed. 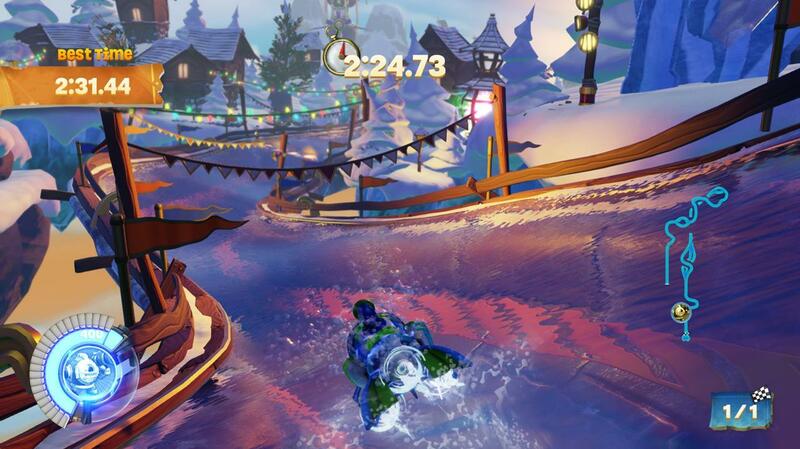 Speaking of playing cooperatively, SuperChargers is the Skylanders game that will allow for online play. I know a few of my friends have been wanting this forever, but you’ll finally be able to go through a campaign with someone else online. The racing can also feature up to four online players as well. To help protect kids, you’ll only be able to use the mic with people on your friends list, which I like. Strangers won’t be to talk to you although they can play with you in races. I wasn’t able to play any of the campaign mode with someone, but I did participate in a few races with three members of the Vicarious Visions staff online. They were playing from their homes as well as I. I’m happy to say the racing was smooth and the framerate never suffered. I didn’t notice any network glitches and the action held up with four people playing. It was fun and easy and a great way to play with friends. The Vicarious Visions folks did say that they thought about upping the amount of players in online mode, but wanted to keep the framerate and experience solid so they opted for four instead. AI racers filled out the rest of the pack. Also, the racing courses were designed so they also provided both a fun and easy experience. Easy in the terms of you won’t get stuck in certain areas for long. 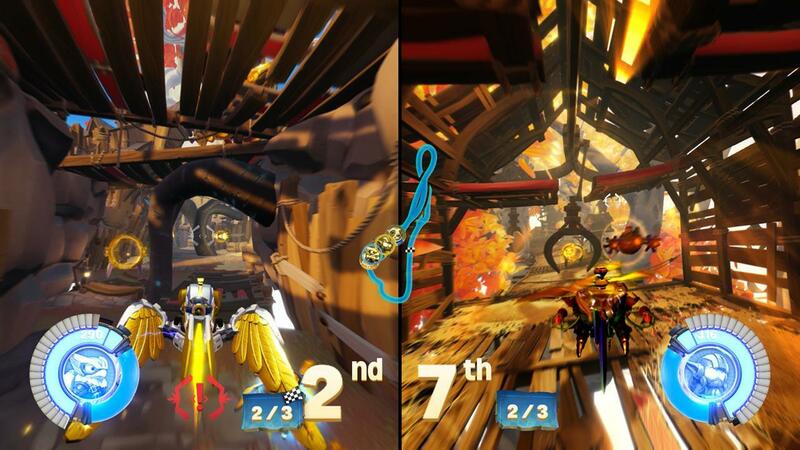 For example, the sky racing levels, for those who do tend to hit the barriers a lot, will keep nudging you forward. 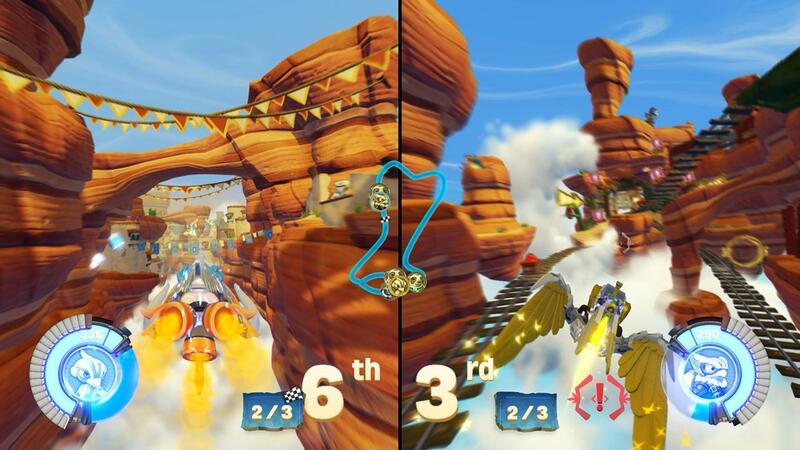 Planes can’t back out so all the levels in those races were designed to keep you moving forward. All the courses have a fun theme and they have some great design elements. I really enjoyed one of the sky races where you saw two groups throwing fruit at each other across the racing area. You’ll see a great deal of moving parts in the environments and the backgrounds aren’t dull, offering up a lot of great eye candy for the young and old to look at. Skylanders SuperChargers is a nice addition to the Skylanders family offering up more gameplay options with the inclusion of vehicles. It’s not just vehicles in the campaign, but a whole racing aspect as well that should add even more hours of fun. Online play is finally in so you can now join in the fun with someone without having to be at their house. All in all, I really enjoyed this year’s entry in the Skylanders line as I think Vicarious Visions did a pretty good job at adding some new wrinkles to the series. A solid outing for this year's Skylanders, SuperChargers is a lot of fun to play and you can now do it online with friends.